We will post Megan, Greg, and Michael’s new register numbers when we know them. For now, here is the address and phone number of the detention center. When I called to ask our friends’ register numbers, they said to call back during business hours tomorrow. Thanks to these citizens for sharing their thoughts through the Knoxville News Sentinel. The quotes below are only excerpts — click the links to read the full articles. The recent verdict of guilty in the Transform Now Plowshares case is a miscarriage of justice. All evidence presented at the trial showed incontestably that the three protesters are deeply committed to nonviolence and that all their symbolic actions were nonviolent, intended to bring a message of peace and healing to the bomb plant. … The defendants clearly felt they were following the path of Jesus, who preached peace and abhorred violence. The Prince of Peace was also accused of sabotaging the Roman Empire. Petition is both a noun and a verb. … If a nun shows up at a government fence with a bottle of wine, some bread and blood to give a message to the government about not bombing innocent children with really bad bombs, she is delivering a petition. … You don’t violate her First Amendment rights because the federal government has ineffective personnel policies. mike was in fine spirits, was interested to hear about media coverage of the trial, said he is doing fine, and expects to go to ocilla any day. he had a pre-sentencing interview, about 20 minutes he said, and has had a couple visits from chris irwin, his lawyer. he doesn’t get to see greg. i conveyed to him how wonderful his testimony in court was and how proud we all are of him. greg was also in good spirits, laughed several times. And that is the news from the Knox County Detention Center! Ralph was not able to visit Sr. Megan, who is at the Knox County Jail (separate facility); Shelley will be visiting her this weekend. Here are the addresses of the three. Sending them mail is one of the best things we can do at this time — let’s all show them that we are thinking of them, and that we’re grateful for their action and witness!! Please note the jail (mis)spelling of Michael’s name. Important tips on sending mail: letters and cards are okay as long as they are just paper. Photos are also okay if they are appropriate. Nothing else may be sent in, not stamps or staples or paper clips. Make sure to write a full return address on envelopes. These addresses will change if/when the three are sent to Ocilla. We will post the new addresses when that change occurs. Also — Greg’s birthday is tomorrow, May 18th. Consider sending him a birthday card! NOTE: The addresses below are no longer appropriate. See the Green “Write the Prisoners” button, above right, for correct addresses in Ocilla. Fran Quigley is an Indianapolis attorney working on local and international poverty issues. His column appears in The Indianapolis Star every other Monday. Can the law and justice ever meet? It struck me that the govt or the corporations felt so threatened by Megan and Michael going to those congressional hearings that they tried to criminalize that by saying they violated a condition of release. I think this is very telling. Remember Greg’s closing statement with regards to the “Good Samaritan” parable. He said we have heard the cries of the people on the side of the road and there are many of them. We are trying to raise their voices, their voices and stories of oppression of fear of living under the threat of the bomb, of feeling the depredation and loss of life-giving resources plundered and squandered for the benefit of a few. The prosecution badgered them about going to far. Why can’t they protest from inside the new hope building or the side of the road he asked over and over again? They couldn’t because they needed to bring the voices of all those people on the side of the road directly to the beast. They marked the beast, they tapped on the shoulder of the beast and begged the beast to listen. Then they went to the people who feed the beast, the lawmakers and policy makers and begged them to listen too. They were begging them to stop feeding the beast with more money. And then they went to the courtroom to the jury in hopes of convincing them that they did this for them too. Megan tried so hard to get them to recognize the spiritual death so many of the workers have undergone by protecting that beast and remaining silent even as they watched their brother and sister workers get sick and die. I really think that these are the things that the shadow government run by these trillion-dollar corporations want to silence. criminalizing them and locking them up is their attempt to assassinate the Word made flesh and carried by the Holy Spirit by the hands and feet of Megan, Michael and Greg and all of us who are supporting them. They are hoping that by criminalizing them especially by labeling them as terrorists, they will be able to defame their character and take away their credibility. But they must know that they have to do that to all of us because you can’t take away the Spirit as long as there are a few people to receive Her and welcome her. That’s what Catholic Workers do. And now we are asking you, the lawyers in particular to bring this message into the judges chambers. This is where justice and the law has the opportunity to meet and this is where justice and mercy might kiss (I think that is from Micah). As you continue to analyse what happened in that courtroom and where you will go next with the law in this last phase of sentencing, I’m hoping you will consider these thoughts that the Spirit raised with me in the night. 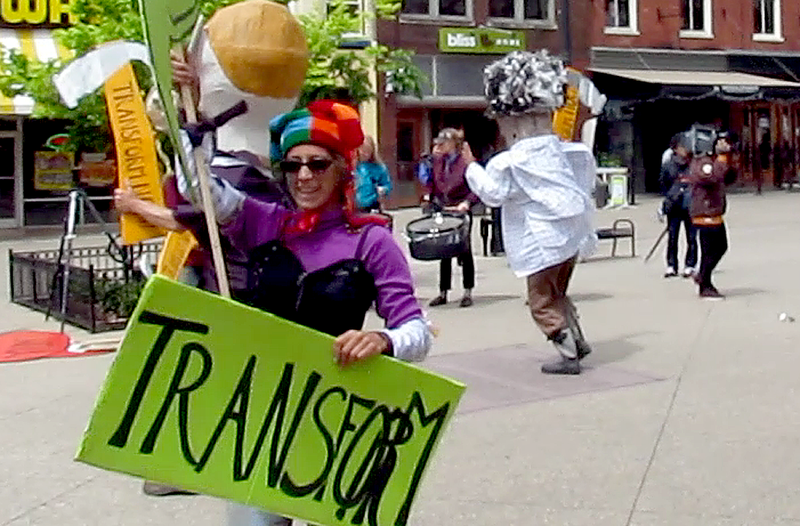 Sue leads a joyful group of citizen disarmer puppets! Sue Frankel-Streit shares a moving reflection on hope in the face of injustice, as our friends Sister Megan Rice, Greg Boertje-Obed, and Michael Walli are in jail pending sentencing. Sue is a founding member of the Little Flower Catholic Worker Farm in Louisa, VA, and she took a hammer to a B-52 as part of the Anzus Plowshares action in 1991. It’s been a number of years since I’ve been to (or in) a Plowshares trial, but standing outside the federal courthouse in Knoxville on Monday as Greg, Michael and Megan prepared to start trial took me right back to those moments when I’ve been there before. Federal courtrooms are intimidating places, surrounded as one is by their rich, dark walls, insignias of state justice and gun-toting Marshalls. The first plowshares trial I witnessed, some 25 years ago, was also one of Greg’s. It was in Philadelphia and he and his codefendant, who’d hammered on a helicopter bound for Latin America, had already hung two juries. I’d been at the Catholic Worker a couple of months, had no idea really, what a plowshares action was or why anyone would do one. After two days of listening to Greg and Lin Romano, the only thing I couldn’t understand was how the judge couldn’t agree with them. As always, the logic of plowshares is impeccable. The reasoning is upheld by international, and even national, laws, and certainly by the defendant’s religion, which is often shared by the judge. The love of the defendants and their desire for a better world shines through their testimony. They have taken a personal risk to act against a clear injustice. Often they are not allowed to explain any of this to the jury, and/or the jury is instructed to disregard much of it. And so they are almost always convicted of crimes that don’t match their actions, and sometimes sentenced to jail time that seems to far outweigh the “crimes”. When Greg and Lin were convicted, I remember being furious and sad and depressed. Years later, when Greg’s wife Michele was convicted, I felt the same way. At the all the plowshares trials I’ve been to, including my own, the injustice of the court seems to pain the supporters more than the defendants. I believe that’s because the defendants have the action to look back on. The moment of complete freedom when you stand beside a nuclear weapon and label it as the injustice it is, despite the likely consequences, is a powerful thing to hold on to. When I saw Greg, Megan and Michael preparing to enter court, my heart flipped and my head bowed as I re-experienced the pain of being shut down in court, the helplessness of watching good people go to jail, the lies let stand in court, and the long, absence-filled days of jail. But then I looked up at Michael Walli, who I’ve known for 25 years, and saw the happiest smile I’ve ever seen on his weathered face. And I knew where that joy came from and I knew he’d be OK. He’d be free no matter where he was. There are a lot of critiques of Plowshares, some of which I share. But in spite of them all, this simple action continues to carry a power far beyond the symbolic disarmament of a weapon. 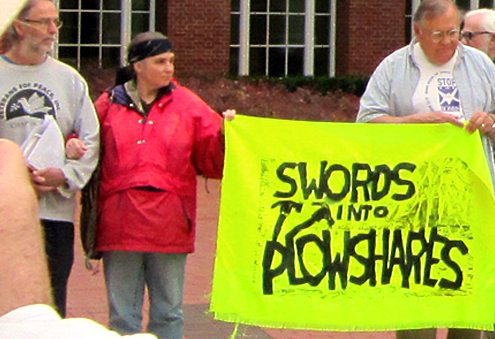 In the end, a plowshares action is an act of hope. I just hope we can all remember that on sentencing day. U.S. District Judge Amul Thapar today issued an order that will keep the convicted Y-12 protesters in jail until their Sept. 23 sentencing hearings. At a hearing Thursday, Thapar discussed case law with attorneys for the U.S. government and those representing the three defendants — Sister Megan Rice, Michael Walli and Greg Boertje-Obed. At that time, the federal judge indicated he would receive information until Tuesday before deciding whether the newly convicted felons would be eligible for release under any circumstances. Today’s order, however, indicates that Thapar looked at all avenues and decided there was no choice — given the seriousness of the felony charges that fall under the definition of “federal crime of terrorism” and carry maximum sentences of 10 or more years — but to keep them incarcerated. Both of the offenses — interfering with or obstructing the national defense and depredation of government property — fell into the category of more serious offenses, so one of the few avenues for possible release would have been the chance for acquittal on one of the charges. In this case, Thapar has yet to rule on the defense motion to dismiss the charge of injuring the national defense. But, regardless, the judge has already denied a motion to dismiss the other charge, so he said that avenue had been closed. “Nor have the defendants shown exceptional circumstances warrant their release pending sentencing,” he wrote in the order. “The defendants must be detained,” he said. He denied the defense motion for release pending sentencing, and said it’s no longer necessary for the U.S. team to file a brief on whether the defendants would be a flight risk. Because that no longer applicable. It’s not clear where the three will be imprisoned, pending their September sentencing. U.S. Marshal Jimmy Fowler earlier this week said Knoxville has been sending their federal prisoners to a facility in Irwin County, Ga., if there’s more than a short-term stay involved.